An annual favorite for memorabilia aficionados, 2017-18 Leaf In The Game Used Hockey is all about the relics. Every box offers just five cards, but all five feature pieces of gear from the sport's history. Presenting quite a few choices, the 2017-18 Leaf In The Game Used Hockey checklist is most easily broken down into the single-subject and multi-player relics. The Letterman showcases game-used letters from the jersey nameplate, while Nickname Hall of Fame highlights the famed monikers for the all-time greats. Other options include the five-relic Rare Materials insert with a mixture of uniform pieces. 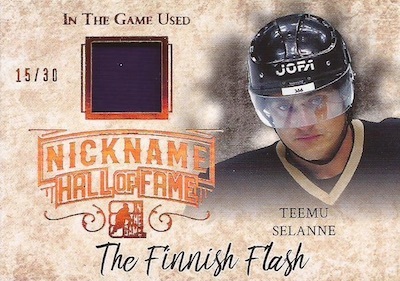 In addition, Vintage Memorabilia sets its sights on the some of the very best from the world of hockey. The Chosen Few is an intriguing line as collectors can pick their preferred one-of-one card from the available selection. 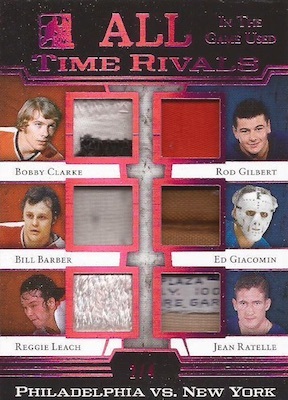 Among the inserts with multiple players on the same card, All-Time Rivals is for the pairings with a heated past, Dynamic Duos looks at top teammates (or those that would have worked well together), and The Final Curtain celebrates legends who ended their careers in the same season. Induction Years relies on the Hockey Hall of Fame to group retired stars. 2017-18 Leaf In The Game Used Hockey also has eight-player All-Time Gr8s, plus The Hard 8 and The Dirty Dozen, which both concentrate on goons and enforcers. However, the Vintage Memorabilia line features the most variety, with Vintage 2, Vintage 4, Vintage 6, Vintage 8, and Vintage 12 editions. Although 2017-18 Leaf In The Game Used Hockey has signed relic cards, as well, they tend to be more rare overall. This includes Signature Swatch cards in Single, Dual and Triple. The Super Patch Exclusive Signatures set is for the young NHL stars that can only sign for Leaf, including Jack Eichel, Nico Hischier and Nolan Patrick. Shop 2017-18 Leaf ITG Used Hockey cards on eBay. FOIL PARALLELS: Purple #/15 or less, Magenta #/7 or less, Green #/5 or less (Spring Expo), Blue #/4 or #/3, Silver #/2, Gold 1/1, Printing Plates 1/1. FOIL PARALLELS: Purple #/12 or less, Magenta #/5 or #/4, Green #/3 or 1/1 (Spring Expo), Blue #/3, Silver #/2, Gold 1/1, Printing Plates 1/1. FOIL PARALLELS: Purple #/6 or #/2, Magenta #/5 or #/2, Blue #/3 or #/2, Silver #/2 or 1/1, Green 1/1 (Spring Expo), Gold 1/1, Printing Plates 1/1. 4 cards. Serial numbered #/35. FOIL PARALLELS: Purple #/15, Magenta #/7, Green #/5 (Spring Expo), Blue #/4, Silver #/2, Gold 1/1, Printing Plates 1/1. 12 cards. Serial numbered #/30. FOIL PARALLELS: Purple #/12, Magenta #/5, Blue #/3, Green #/3 (Spring Expo), Silver #/2, Gold 1/1. PRIME PARALLELS: Bronze #/9, Purple #/6, Magenta #/4, Blue #/3, Silver #/2, Green #/1 (Spring Expo), Gold 1/1. FOIL PARALLELS: Purple #/12, Magenta #/7, Blue #/4, Green #/3 or less (Spring Expo), Silver #/2, Gold 1/1. PRIME PARALLELS: Bronze #/6, Purple #/5, Magenta #/4, Blue #/3, Silver #/2, Green #/1 (Spring Expo), Gold 1/1. 18 cards. Serial numbered #/25. FOIL PARALLELS: Purple #/12 (Card #15,16 - #/9), Magenta #/7, Blue #/4, Green #/3 (Spring Expo), Silver #/2, Gold 1/1. PRIME PARALLELS: Bronze #/9, Purple #/5, Magenta #/4, Blue #/3, Silver #/2, Green #/1 (Spring Expo), Gold 1/1. FOIL PARALLELS: Purple #/12 or less, Magenta #/5 or less, Blue #/4 or less, Green #/3 or less (Spring Expo), Silver #/2 or 1/1, Gold 1/1. FOIL PARALLELS: Purple #/6, Magenta #/4, Blue #/3, Green #/3 or #/2 (Spring Expo), Silver #/2, Gold 1/1. FOIL PARALLELS: Blue #/3, Silver #/2, Gold 1/1. FOIL PARALLELS: Purple #/9 or less, Magenta #/5 or #/4, Blue #/3, Green #/2 or 1/1 (Spring Expo), Silver #/2, Gold 1/1. 3 cards. Serial numbered #/20. FOIL PARALLELS: Purple #/7, Magenta #/5, Blue #/3, Green #/3 (Spring Expo), Silver #/2, Gold 1/1. 64 cards. Serial numbered 1/1. FOIL PARALLELS: Purple #/12 or less, Magenta #/7 or less, Blue #/4 or less, Green #/4 or less (Spring Expo), Silver #/2 or 1/1, Gold 1/1. FOIL PARALLELS: Purple #/5 or less, Magenta #/4 or less, Blue #/3 or less, Silver #/2 or 1/1, Green 1/1 (Spring Expo), Gold 1/1. FOIL PARALLELS: Purple #/4 or less, Magenta #/3 or less, Blue #/2 or 1/1, Silver 1/1, Green 1/1 (Spring Expo), Gold 1/1. FOIL PARALLELS: Purple #/4 or less, Magenta #/3 or #/2, Blue #/2 or 1/1, Silver #/2 or 1/1, Green 1/1 (Spring Expo), Gold 1/1. FOIL PARALLELS: Purple #/3 or #/2, Magenta #/2 or 1/1, Blue #/2 or 1/1, Silver #/2 or 1/1, Green 1/1 (Spring Expo), Gold 1/1. FOIL PARALLELS: Purple #/2, Magenta #/2 or 1/1, Blue #/2 or 1/1, Silver #/2 or 1/1, Green 1/1 (Spring Expo), Gold 1/1. FOIL PARALLELS: Silver 1/1, Gold 1/1. Awesome mix of Vintage Memorabilia and HOFers Autos & Memorabilia. Card are all low numbered. Vintage Collectors Dream Product. Price lower than I expected. Well done Leaf/ITG !!! Just about every other Super Patch Autos are miscut.